The Hobbit, Three Paintings and Coming Home. The end of every year is a weird time for me. There is a combination of panic (oh my god, the year’s ending and I haven’t actually started it yet), unrealistic anticipation of change (next year I’m going to grow 5 cm and be super chilled about everything), and extreme fatigue (is it ok to just spend the whole day dreaming of being asleep?) Paradoxically, I also tend to hatch Big New Projects towards the end of a year. At the end of 2017 I decided it was time to buy myself a house. Eleven years of renting in the city, low property prices and the need to write the next chapter in the book of ‘Greg’s never coming back and you need to re-claim your life’ were pushing me into this decision. I also had a stack of money sitting in the bank, more than I’d ever had before, because I’d sold the family home in the seaside town of Albany, (sold it almost by accident to my lovely tenants without even putting it on the market), and it was the obvious that the Universe was sending me huge signals. Unfortunately, that stack of money wasn’t quite high enough to buy me a home in the swanky riverside suburbs I’d been renting in. And nearly four years after my husband Greg passed away, it was finally dawning on me that he wasn’t about to walk through the door and tell me his death wasn’t a Big Mistake and he was actually fine and strong and alive. I had to work out where I was going to live the rest of my life, alone. I picked the Perth Hills. Property prices were affordable, blocks were large, I could build my studio, and most importantly, my sister Susheel lived there and it felt comforting to have family just down the road. So I started looking, and my niece Carmel and my brother-in-law, Kevin both at various times, kindly offered to be my house-hunting buddies. We looked at 18 houses in total. I hated them all. Then, 10 minutes before the ‘home open’ closed on a house that had just popped onto the market, Kev and I walked into it and my world changed. The house sat on the gentle slope and seemed to be suspended in the middle of a jarrah forest. As soon as I walked in the front door, my gaze was led to the uninterrupted view of trees just outside the big glass windows. It took my breath away. But then I glanced to the right and it felt like my heart actually stopped. Three paintings hung on the wall. Three paintings that looked incredibly familiar, so familiar I felt like I knew them. Actually, I did. I painted them. That lady, a total stranger, happened to be the owner of this house that I had just walked into. Greg had named those paintings The Wine of Astonishment I, II and III. Twelve years later, you could say astonishment was one of the many emotions I was feeling. We spent the ten minutes we had left before the agent closed the house, walking around the house and block, with me trying to think rationally and forget the three paintings. Finally I asked Kev what he thought. Now Kevin is a much-published Professor of Biochemistry at the University of Western Australia, and I hadn’t ever heard him talk of “nice feeling houses” in the 38 years I’d known him. First the paintings, now Kevin is talking about feelings. Interesting. But wait there’s more. At the very end of the block stood a large tree. On that tree was painted a green door with the word “Baggins” written on it. And the name of the company that built the house? The Hobbit Building Company. Why does this mean anything? To say that Greg and I were Lord of the Rings fans would be a bit of an understatement. Well before the movies came out, I had read all the books multiple times. We loved the imagery, the artistry, the poetry, the damn good story telling. We’d been to Hobbiton in New Zealand, which was almost a sacred experience for us. I wrote about it here. We were basically LOTR nerds. If Greg had’ve materialised from the other side and said aloud to me “buy this house” it couldn’t have been clearer. 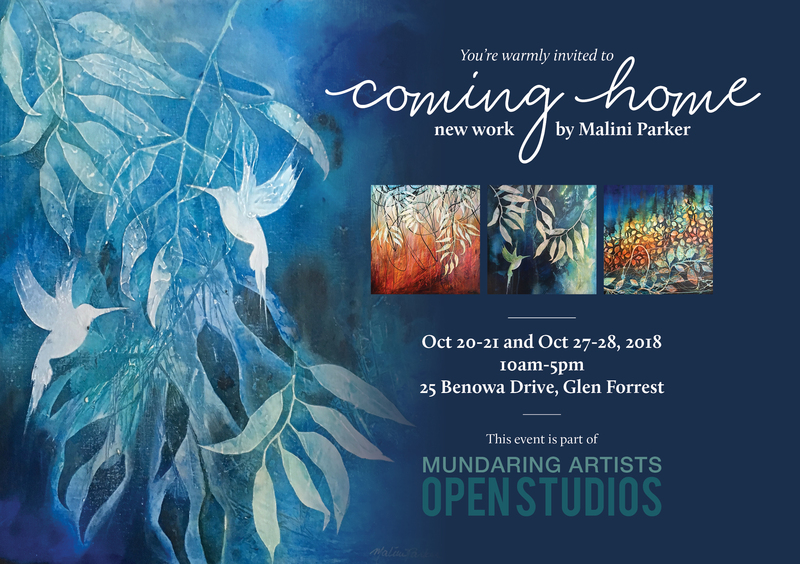 I moved in 4 months later, and shortly after that, through a chance encounter with Neil Elliott, the organiser of the Mundaring Artists Open Studios, I was invited to be a part of this wonderful initiative where artists in the region open their studios to the public to show and sell their creative offerings. Just like that, 2018 became the year I finally broke the artistic drought that has been stopping me from holding a major exhibition since Greg died. I don’t have a studio (yet). So I’m using the outer walls of my little cedar cottage and the large deck that hugs it, as my gallery space. And I’ve converted part of my lounge into my painting room. It sort of looks like creative hell exploded in my living room and had babies. My dog is befuddled by the constantly changing surface area of our home. Her fur is covered in paint. My fingers are stiff from holding a paintbrush and my arms ache from the unaccustomed workload of creating art day and night. My heart soars one minute and panics the next. Making art is a risky business. You put your heart and soul into your work, that’s essentially destined to hang on someone else’s wall … or to be stored under your bed. You just don’t know. So you give in to the creative addiction and just keep making art with no certainty, absolutely none, that your work has value in the eyes of the beholder. Its equal parts frightening and exciting. I’m calling this, my 11th solo exhibition, Coming Home. Like my paintings, the title is multi-layered. On the very obvious level, I’m inviting you all to come on over to my home 🙂 Then there is the story of me buying my own home, for the first time, on my own, and this choice leading to this show. And then, perhaps most importantly, there is the journey we’re all on… of coming home to ourselves, which has been accelerated for me since I lost Greg. I’ve had many guides and mentors in my life. But making art has been my greatest teacher. My faith, my service, my devotion has rolled into one activity, that requires me to practice my core beliefs and see them taking shape under the brush. When I lose sight of where I’m going, my painting reminds me that no one actually knows where we’re going, we just make a mark and let go, trusting that it will all come together at the end. And that every single messy, imperfect stroke, bump, image, line and dot is just part of a layer that eventually unfolds into another layer. Just like every single messy imperfect bit of our lives. Creating something, when before there was nothing, is a mysterious phenomenon. It’s been the single most important phenomenon in helping me find my way home. I know this story and still get goodbumps! Can’t wait to be there for the exhibition! Aww what a nice thing to say Yvonne! So glad it strikes a chord. Big love. OMG! Like Shanthi, I know the components of the story, but when you tell it like this, it’s hard not to see the workings of the Universe, and Greg doing his Magic Tricks from the Land of Mysteries. What a treat this exhibition will be for all of us. Yes, that’s so true Tonia. We have to be ready to read the signs, but in this situation, it wasn’t hard !! 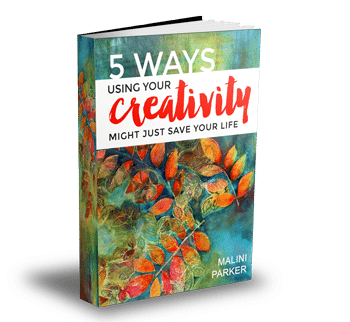 Wonderful blog post, Malini! I always enjoy reading your blogs. I so enjoy reading your blog. Like Yvonne above, I look forward to it and feel excited seeing it sitting in my box. Thankyou for sharing your stories; especially the ones that confirm chaos is a totally acceptable part of creativity and where ever I am is exactly where I’m supposed to be. Looking forward to seeing your amazing creations and beautiful You soon!! YAY!!!! I look forward to seeing you on the 28th! LAST DAY! wonderful! Thank you Malini for the beautiful story of your journey. It was a pleasure to read. I would love to see your new home and paintings but I’m travelling at the moment. Our spirit angels are always communicating with us – through birds and our intuition. We have have to be in the NOW to see it- Eckhart Tolle. oh lord, I wish I was closer. Thank you for sharing this story Malini. How wonderfully mysterious and exciting. 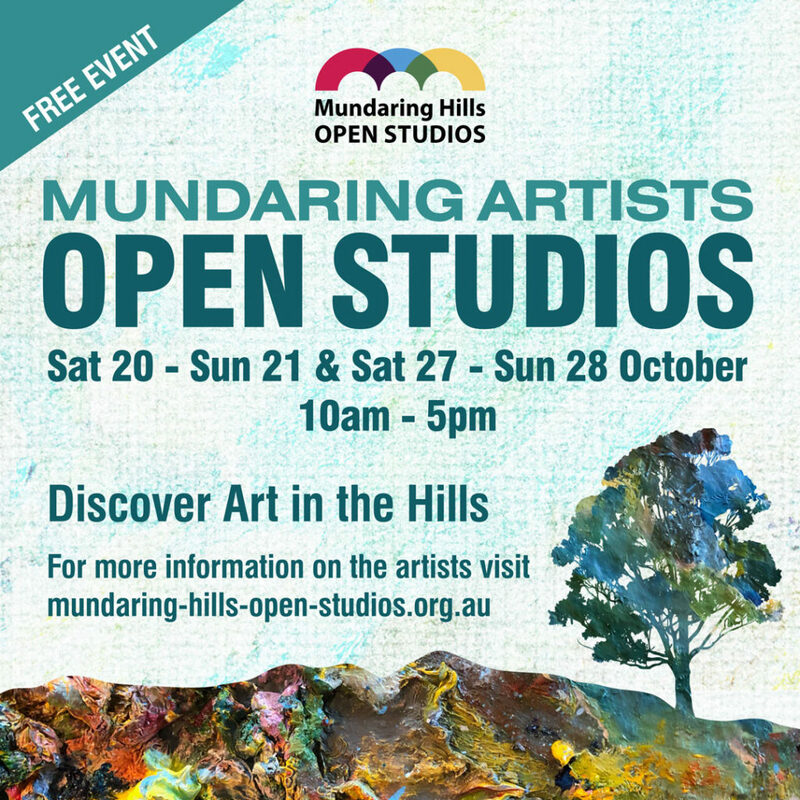 I will be very keen to try and come to the hills to see your latest work! We can’t wait for the exhibition! So exciting! And, how incredible Dad named the paintings The Wine of Astonishment only for you to be so astonished by the paintings and the trees and Uncle Kev talking about his feelings…… there are really no accidents and it is so amazing when things just UNFOLD…. and are laid out before you and it is such a surprise but it is meant to be…..
Uncle Kev took exception to the description! He said the house had a nice feeling, but I never talked about my feelings! 🙂 🙂 And yes, Dad named those paintings TWELVE years ago!! So beautifully written, as always. Wow, what an amazing experience you had. I love to read your newsletters, always so incredibly beautifully written ! What a beautiful story, you are truly an amazing writer Malini. Wish I could come over immediately. Malini, I’m not much of a writer/explainer…….if there’s such a word hahaha…….would you need an apprentice, by any chance? I’m at a very interesting stage of my life, where I feel the need to break away from life and just paint and paint……I’d be truly happy to be able to do this anytime you are able to……and would consider it an honour to learn from you. Why does it feel like when you let us into your world so generously that I can breathe a little deeper, accept myself as I am that much more and celebrate where I am in the unknown and let go of clutching at the walls and straining my ears for answers….thank you for the inspiration to let go. oh kate, your words are rather poetic and inspiring to me 🙂 I’m so glad this story resonates with you. We’re all so human. I struggle to let go to, but when I write the stories, it reminds me. Oh Malini what a wonderful post. You were certainly meant to have that particular home…as against just getting a house. I can imagine Greg smiling and thinking ‘yeah she listened, looked and found her special place’. He would rejoice your bravery, spirit and love. Go girl. A beautiful story – A beautiful heart. So glad you came home. May your journey be filled with many more miracles and blessings. Fantastic how everything came together ! I love your miracles! Your precious blog sits in my Inbox till I have the luxury of time to read it. Don’t want to skim thru but take my time to enjoy your stories. 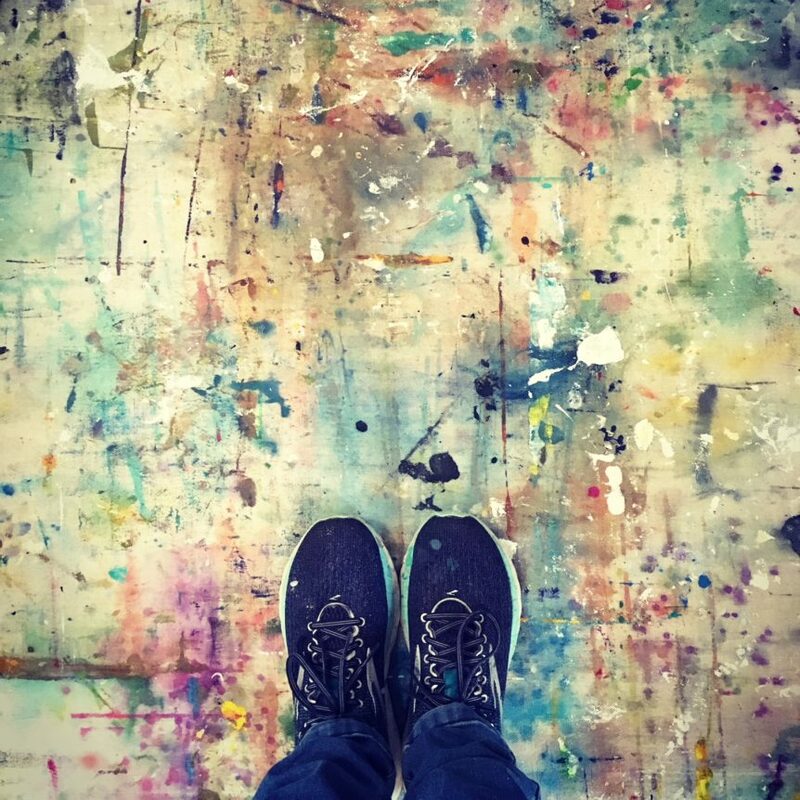 You not only have the gift of creativity in painting, you have a way with words. What a lovely story-teller you are. Best wishes for this new phase in life and for your exhibition too. God bless. Malini, my sister and I visited your exhibition at your beautiful home, I travelled from the Midwest to attend. When we walked in I had the strangest feeling of calm, after a hectic day it was profound. I didn’t say anything to my sister until we got into the car, my sister said that this was the best exhibit we had been to all day, she had felt something too. Thankyou for allowing us to visit your exhibit and home. We hope to attend a workshop with you in the future when all the stars align.